Accidents do happen, right? Sometimes you’re out with a lovely companion just having some drinks, laughing and taking some pictures along the way when the inevitable happens: you drop the small bag carrying your DSLR. Not allowing it to ruin your social interaction, you pass it off and let the evening go on. (Disclaimer: Purely hypothetical event; author denies any involvement with said lovely companion.) In the morning you find out exactly what happened: the plastic tabs on the mount of your lens have broken off. While most people would probably write off the whole lens altogether, it just doesn’t seem economical when a fix shouldn’t be that hard. Assuming you guys have had the same experience with this bayonet mount problem, we’ll let you know how we fixed ours. Hop over the jump for this episode of “How To Fix Your Sh*t: Nikon Bayonet Mount (AF-S 18-55/18-105/18-135 Variants)”. 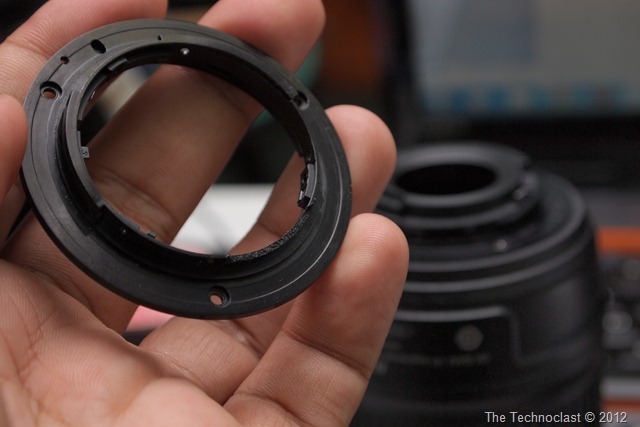 So there you have it folks: a video on how to repair the bayonet mount on your Nikon AF-S lenses. You can purchase your own replacement bayonet mount from Ownta here. It cost us about $9.33 for the mount and $4.81 for basic shipping – giving us a total of US$14.14 and translates to about 605 Philippine Pesos. (+ 40 Pesos post office fee) Given that even the 18-55 kit lens costs about PHP 3-5k in the 2nd hand market, it wouldn’t be a good idea to put a perfectly good one to waste. Hopefully the handful of people in the world who’ll need this fix – and their lovely companions – will be happier now that their lenses are safe from garbage bins.